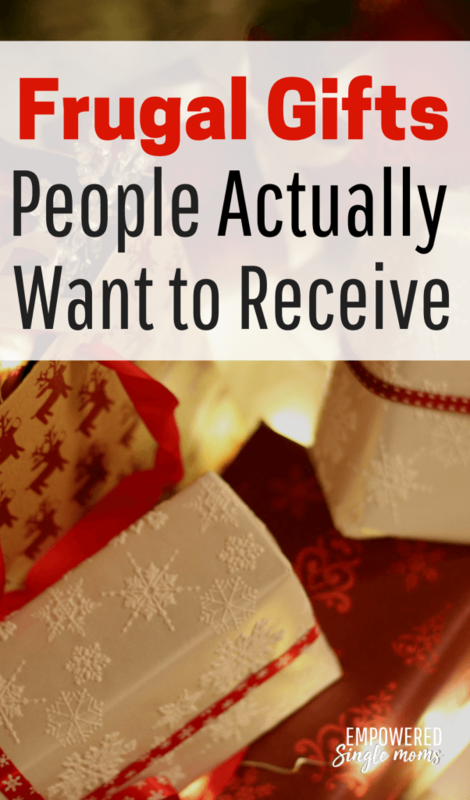 Frugal gifts can solve a multitude of problems. It is a dilemma to be generous and stay within a budget. I don’t want to be paying for Christmas in July and I am sure you don’t either. It takes all the joy out of giving to be saddled with debt for months on end. Then there is the shopping in packed stores, which can be stressful both because of the crowds and all the time it takes. 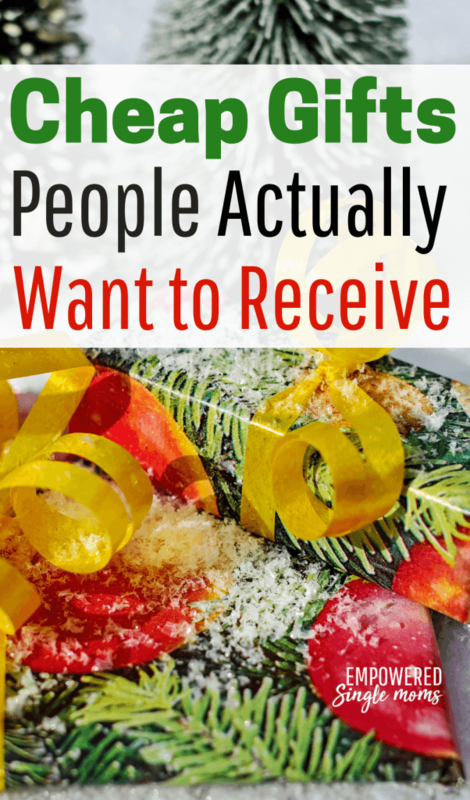 How Can I Be Frugal at Christmas? Start by signing up for Ebates here. I have an Ebates extension on my browser so anytime I shop online it automatically checks to see if I can get a discount. This is the easiest way I’ve found to save on online shopping whether I am buying Christmas presents, birthday presents or just getting things I need to run my home and business. Making these DIY Christmas gifts can be part of the fun. If you want to be really frugal you might even try selling some of your creations so other people have homemade gifts to give. Homemade Soap is easier than you think. Here is a book on soap making or you can get a kit here. 2. Candles you make There are many options to use for the containers. You can use mason jars or check out garage sales and thrift stores for pretty glasses or bowls that are unique. You will need wicks, wax, and something to melt the wax in like an old pot (which you can also pick up at the thrift store or this metal pitcher. Essential oils add a nice scent if you want to use those and the receiver is not sensitive to scents. If you want colored candles take the paper off of broken crayons and add them to the wax while melting it. 3. Photographs are an especially good gift for grandparents and you can get a collage frame, make a calendar at a photo processing lab or enlarge a favorite photo and frame it. A canvas wrap photo also makes a lovely gift and can be done at most photo processing companies. 4. Build Something sometimes stores with lumber yards will have Saturday classes where kids and parents work together to make simple projects like bookends, bird feeders or other small projects. These are great experiences and the children can gain confidence in making simple projects with minimal tools. This book also has some ideas. The bird feeder looks very doable and useful. If you want a kit the one below has everything you need to make 3 projects. Do it as an activity with the children and the gifts will be especially cherished. The toolbox also makes a great napkin holder or container for picnic silverware or supplies for grilling. You can spiff them up a little more by painting them or leave them as is depending on the style of the receiver. Here are a few last minute ideas, because let’s face it, if you are like me I always mean to get done with Christmas gift making and buying early, but December 23 finds me with a few things left to do. 5. Homemade Coupons for babysitting, a home cooked meal, manicure given by you, back rub or some other skill you have that you are willing to share. Maybe you can give a few music lessons or knitting lessons. 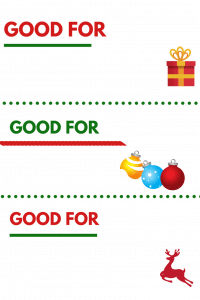 I made some Christmas coupons for you to fill out and have a few more ideas on what you could use them to give. Get the coupons in my free resource library when you subscribe to my newsletter. 6. Gifts from your kitchen bars, cookies, homemade candy are traditional gifts at the holidays, but why stop there? Most people consider homemade bread a special treat. Another idea is to make a double batch of a meal that freezes well and give the other half away as a gift. To get you started chili, beef stew, meatloaf, and lasagna all freeze well. For something different, you could try this Or make a favorite appetizer and give that as a gift. This dip is on my menu for the holidays and I am making a double batch, so I can give some as a gift. What are Good Frugal Gifts to Buy? Ship gifts for free with Amazon Prime and save more money. Need more ideas on crafting with repurposed items? Here are some more ideas. 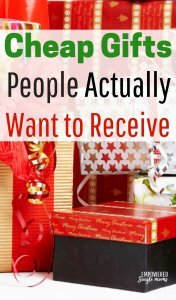 If you are looking for good cheap gifts for friends these ideas are for you. 7. Books are a frugal gift. I am listening to this one now on Audible my favorite way to “read books”. Get a free 30 day trial of Audible for your self and get 2 books free. You can make the book more meaningful with a little extra thought. When you give something you have enjoyed write a note saying why you think the receiver may enjoy it. Many people like to read a book set in the location they will be taking a trip or set near where they live. This is one of my favorite series that takes place near where I live. 9. Local specialties are another great idea. You could give a gift card to a favorite local restaurant to in town friends or family. Do you have a unique specialty store nearby? We have a great specialty oil and vinegar store. Local specialty gifts are extra special for out of town friends or family. Some ideas from where I live are a local winery, a local brewery, local wild rice, and the local woolen mill. What are some special things made or harvested where you live? 12. Meal Planning Service This one is great you get to choose between Whole 30, Traditional and Crockpot Meals. She also includes a week of freezer meals. Give a month, a quarter or a year of meal plans including recipes and grocery lists. 13. Virtual Assistant–Echo Dot Play music, make calls, send messages, set alarms, read books and so much more. LIghted hats make walking or running after dark safer and some of them are just plain fun. Quick, easy, inexpensive recipes for your frugal friends. Try Amazon Prime 30-Day Free Trial you get free shipping to send all those gifts to out of town family or avoid the stores and have everything shipped to your house. Here is the Pinterest pin. Pin it to your Christmas or Gifts board for later. 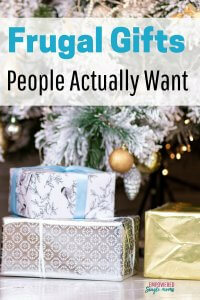 What are some of your favorite frugal gifts to give or receive?